Your skin is your largest organ of your body. Your skin is water, protein, lipids, and different minerals and natural chemicals. Your skin is made to protect you from infections and germs. Your skin changes often and will regenerate itself around the same moon cycle of 27-28 days. Taking care of your skin is crucial to maintaining the health and vitality of this special, protective organ. As with any medicinal product, you must pay special attention and use carefully. Use for itch and rash relief, skin irritation and insect bites as well as overall skin health! You should get to know all the parts of your skin that way you will notice any changes that might occur, such as different moles or patches that might indicate a skin problem. If you have a question or concern, see your doctor. Products are available for pickup. If you would like to get a supply, please call 856-332-3817 and leave a message! DO NOT USE THE PAYPAL BUTTON FOR PICKUP! You should thoroughly cleanse twice daily and make sure you remove all your make-up at night and cleanse properly and exfoliate before going to bed. Use a gentle soap without fragrance. Rinse with mild soap in the morning and enjoy your newly regenerated skin from a good night’s rest. Moisturizing is recommended even if you have oily skin. Natural oils do not clog poor’s and the benefits will be a clear radiant complexion. A natural, non-chemical sunscreen is probably the most important thing that you can do for your skin. Even in the winter and on cloudy days, you should put natural oil sunscreen on every day. This should be done even if you are not outside often. Limit your time in the sun, and pay special attention to the hours of 10 a.m. and 2 p.m., and wearing a covering type of clothing, such as a long-sleeved shirt, pants, and a wide-brimmed hat, are also recommended. The main ingredient, Olive oil contains three major antioxidants: vitamin E, polyphenols, and phytosterols. These antioxidants, when applied to the skin, may help protect the skin from premature skin aging. Vitamin E partly accounts for the anti-aging benefits of olive oil because it helps restore skin smoothness and protects against ultraviolet light. Hydroxytyrosol, a somewhat rare compound that is found in olive oil, also prevents the free radical damage to the skin. Olive oil penetrates deeply into the skin while providing a cleansing effect. Use olive oil at night as your regular moisturizer. Apply a teaspoon of the Indigenous “Medicine Flower” Oil to the face and neck. A common exfoliating method using olive oil is to mix 1 tablespoon of the oil with natural sea salt, rubbing this mixture over the skin. The mild abrasive qualities of the sea salt, combined with the deep, penetrating action of the oil, will remove dead skin cells and leave your skin looking renewed and glowing. The second ingredient is Grape seed oil which contains antioxidants and anti-inflammatory properties, both of which are great for stopping acne. This oil also contains linoleic acid, which is great for promoting renewed skin health. Grape seed oil also has astringent quality that helps tighten skin and close up the pores, thereby helping you avoid clogging that could lead to pimples. Oily skin can especially benefit from this oil. Grape seed oil, applied daily for a few weeks, can relieve the dark circles naturally. Fine lines and wrinkles can be less noticeable with daily use of grape seed oil on the skin. The elasticity of the skin can be improved, and the lines of an aging face less pronounced. Grape seed oil was once the well-kept secret of many traditional cosmetic companies. It's an easily absorbed, gentle oil that is light on the skin. In addition to an ideal viscosity, grape seed oil is extremely rich in beta-carotene and vitamins D, C, E. It also has a concentration of essential fatty acids like palmitic, stearic, and linoleic acid. Grape seed oil has also proven to be effective at minimizing the prominence and size of scars. Apply a small amount of Indigenous “Medicine Flower” Oil to your hands and massage it into the skin. Pay close attention to areas with scars or blemishes, or rough areas. When massaged on the skin, it can not only moisturize but also help new scars to heal. Simply apply a few drops of the oil to the area underneath your eyes with your fingertip. Massage it in very gently; you would begin to see results after a week. Indigenous “Medicine Flower” Oil can also be used to treat wrinkles and fine lines. The third ingredient, (Boswellia) Frankincense Oil promotes regeneration of healthy cells and also keeps the existing cells and tissues healthy. When you combine this oil with its powerful astringent capabilities, you have a potent anti-aging quality that frankincense oil is often used for. It can help you to eliminate sun spots, remove micro-wrinkles around the eyes and cheeks, and generally tone and tighten skin all over your body, while simultaneously replacing old or dying cells with new, healthy ones. Frankincense is known as the holy anointing oil in the Middle East, where it has been used in religious ceremonies for thousands of years. It was valued more than gold during ancient times, and only those with great wealth and abundance possessed it. Frankincense is also a valuable ingredient in skin care products for aging and dry skin. Although Indigenous “Medicine Flower” Oil is one of the safest oils it’s always wise to put 2 to 3 drops on the inside of your forearm to test for reaction before using elsewhere on your body. 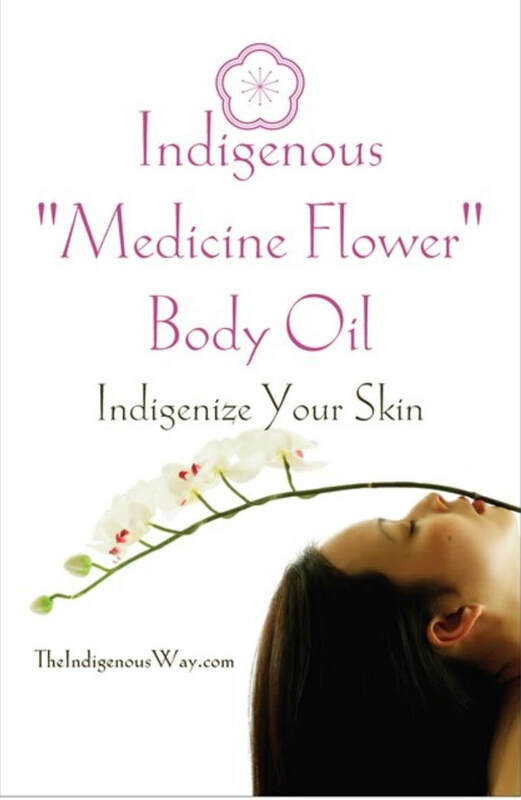 Indigenous “Medicine Flower” Oil is great for your skin. It promotes the regeneration of healthy skin cells. It is a great oil to use for scarring, cuts, stretch marks, pockmarks and some moles. It is also used as an anti-aging oil to reduce wrinkles and slow signs of aging.